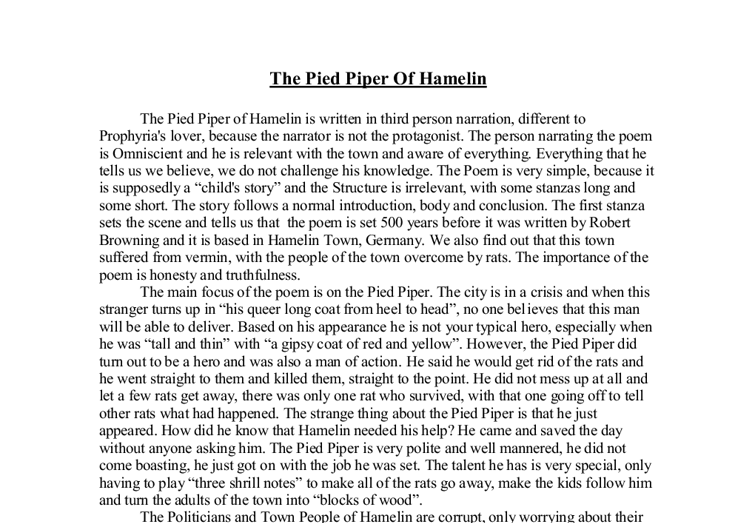 The Pied Piper Of Hamelin The Pied Piper of Hamelin is written in third person narration, different to Prophyria's lover, because the narrator is not the protagonist. The person narrating the poem is Omniscient and he is relevant with the town and aware of everything. Everything that he tells us we believe, we do not challenge his knowledge. The Poem is very simple, because it is supposedly a "child's story" and the Structure is irrelevant, with some stanzas long and some short. The story follows a normal introduction, body and conclusion. The first stanza sets the scene and tells us that the poem is set 500 years before it was written by Robert Browning and it is based in Hamelin Town, Germany. We also find out that this town suffered from vermin, with the people of the town overcome by rats. The importance of the poem is honesty and truthfulness. 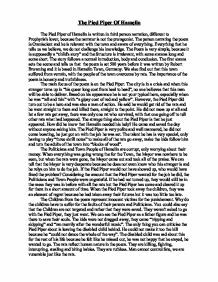 The main focus of the poem is on the Pied Piper. The city is in a crisis and when this stranger turns up in "his queer long coat from heel to head", no one believes that this man will be able to deliver. ...read more. If he had not turned up, they would still be in the mess they was in before with all the rats but the Pied Piper has come and cleared it up for them in a short amount of time. When the Pied Piper took away the children, they was an element of regret because he had taken away their futures but it was too little too late. The Children from the poem represent innocent victims for the punishement. Why do the children have to suffer for the faults of their parents and Politicians. You could also say that the Children are not targeted and rather that they were saved. They weren't asked to go with the Pied Piper, they just went. We can see the Pied Piper as a father figure and he was there to save their souls. The kids were not dragged away, they came "tripping and skipping" and "ran merrily after the wonderful music". The only thing you can criticise the Pied Piper about is leaving the disabled child behind. He could not make it too the hill because he "could not dance the whole of the way". ...read more. We also see Dramatic Irony because the Mayor does not know what he is getting himself into by messing with the Pied Piper but we had seen his powers before with the rats, so we immediately knew that the Mayor was leading a bad path. The poem had a happy ending but not for everyone. The ending was only happy for the children, the rats were killed, the Town's People had their children taken away and there was a forever lasting sadness in the town of Hamelin, being constantly reminded of the day the Pied Piper came. The subtitle of the poem, "A Child's Story" does reflect the poem overall because there are lessons to be learn from the Town's People. If the poem was read to a child, it would have to be explained to them, to show them the true meaning of it. Even though an adult would read the poem to them, they would still feel the suspense of what is going to happen next and could visualise the setting of the poem. On the other hand the poem has parts of it that are not really suitable for a child, corruption, rats killing humans and general stuff that would not really be seen in a childs story. ...read more. Poetry Analysis of 'Night of the Scorpion' by Nissim Ezekiel, and 'Sacrifice' by TaufiqRafat. In the fourth stanza, the children, blank templates, are looking on over this "tableau", being programmed as though this is a normal occurrence. The "Night of the Scorpion" had a lot of comparisons such as the peasants are compared to fly's swarming and the shadows like giant scorpions. Scene Two of Act Two withholds an example of this; while Iago is questioned by Othello concerning the reason of the "barbarous brawl." "Touch me not so near. /I had rather have this tongue cut from my mouth/than it should do offense to Michael Cassio; Yet I persuade myself to speak the truth/Shall nothing wrong him." The title tells that death of the lover and his beloved has already taken place and at the moment a confession of love is going on. When you do something wrong your parents are always quick to correct you and show you that what you have done is not right. Whitman also writes "the pleasures of heaven are with me and the pains of hell are with me". The parallel structure, featuring firstly the subject of pleasure and later pain, acknowledges that without the "pains of hell" one would not be able to fully appreciate the "pleasures of heaven". He also thinks they are alive as he says "host of daffodils" or "dancing daffodils". He describes himself as isolated and lonely but happy as he is saying" the bliss of solitude". He imagines the dancing daffodils while lying on his couch, therefore he feels very happy and pleased. same thing, but both are effective in their conveyance of the theme using individual styles. In order to create the moods mentioned above in each poem, the separate poets had to employ sound techniques to do the job, so to speak.